Yes, the all-conquering egg-shaped hero is back in yet another mega-adventure with all his friends and relatives. However, his Yolkfolk aren't too happy at the moment, due to Dizzy's part in destroying the evil wizard Zaks. Having made all the necessary precautions for a premature demise, Zaks has transported all Dizzy's friends into a weird fairy-tale world, each into a very embarrassing situation, which Dizzy must save them from. For example, Daisy has been enlarged and trapped in Zaks oubliette, (very nasty), Dora has been turned into a frog and Dozy, well, what else would Dozy be doing but sleeping. This time however, he is in a deep magical sleep from which he might never return, unless Dizzy can do anything about it, that is. Along the way, and in true Dizzy style, there are hordes of puzzles to be solved and a host of items to be picked up, each in a special order, to allow you to progress further into the game. Working your way through each successively weird scenario, Dizzy must find the enchanted sword Excalibur and brave the wicked witch's island in his quest to save his friends, before going on to finish off Zaks once and for all in the grand finale. 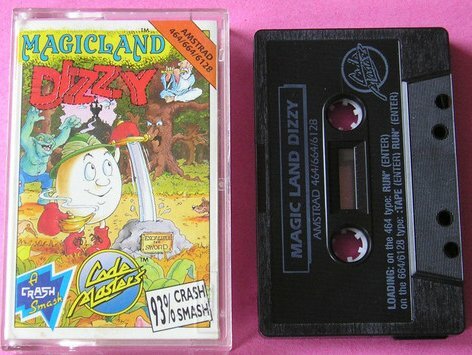 Featuring the stunning graphics and effects we've come to expect from the Oliver Twins, Magicland Dizzy is an absolute must, whether you're a Dizzy collector or not. » Topic: Cheats, pokes ou solution pour "DIZZY 4: MAGICLAND DIZZY"